Under Fed Chairman Ben Bernanke, the Fed has been the great enabler of Washington’s fiscal excesses of the past few years. The Fed’s quantitative easing blurs the line between fiscal and monetary policies. The Fed may still be politically independent, but fiscal policy has become very dependent on the willingness of the Fed to purchase lots of government securities. A consolidated statement of the US Treasury and the Fed would show that $1.7 trillion of US government debt, which is held at the Fed, is costing the government only 0.25%. In yesterday’s WSJ, Jon Hilsenrath reported that the FOMC is likely to vote for QE4 when the committee meets on December 11-12. In September, the FOMC implemented QE3, i.e., an open-ended commitment to purchase mortgage-backed securities at the rate of $40 billion per month. The Fed’s Operation Twist is scheduled to terminate at the end of the year. Under this program, the Fed purchased $45 billion a month in long-term Treasuries, paying for them with the proceeds from its holdings of short-term debt. Even more generous than the Fed have been foreign central banks. Their holdings of US Treasuries rose to a record $2.9 trillion during the week of November 7. Let’s face it: A deal to fix the fiscal cliff won’t fix our structural deficit problem. Washington will probably avert the cliff, but continue to run insane deficits. The Fed and other central banks will continue to enable this insanity by purchasing lots of US Treasuries. Eventually, this may lead to inflation. However, the more likely scenario is that our kids will be buried under all the debt that we are leaving them. We may get a stay of execution, but the next generation won’t. Earlier this year, there was widespread concern about the slowdown in US economic growth. Real GDP rose 2.0% (q/q saar) during Q1 and only 1.3% during Q2. The preliminary official estimate for Q3 edged back up to a still anemic 2.0%. That triggered some chatter that the economy was too close to “stall speed.” There were similar concerns expressed during 2010 and 2011. In the past, whenever the y/y growth rate of real GDP fell below 2.0%, a recession followed. That strongly suggests that rolling a pair of snake eyes is bad luck for the economy. Last year’s low was 1.6% y/y during Q3. So far this year, the lowest reading was 2.1% y/y during Q2. Yet the economy is still chugging along. On Thursday, Q3’s real GDP is likely to be revised up significantly to 2.8% (q/q saar), according to the latest consensus of economists compiled by Bloomberg. That would put the y/y growth rate at 2.5%. The good news is that industry analysts may be ready to take a rest over the rest of the year after cutting their S&P 500 earnings expectations during October’s Q3 earnings season. They continued to lower their estimates for Q4 during the week of November 22, but they did less of that for the four quarters of next year. Their 2013 estimate edged down last week, but should start to stabilize around $113 through the end of the year and until the next earnings season during January. For industry analysts, the long term is 2014, and their estimate for that year edged up to $127 last week, a projected increase of about 12% y/y. So while forward earnings are showing signs of stalling recently, they should be moving to new highs again if 2014 estimates hold up. Friday’s 1.3% rally in the S&P 500 (along with comparable jumps in other stock markets around the world) was triggered by good news out of Germany. The Ifo economic institute's closely watched business climate index rose to 101.4 in November from 100.0 a month earlier. That’s after falling for six months amid the euro zone's debt crisis. It defied expectations of a renewed downturn in November as both the assessment of current conditions and business expectations for the coming six months recovered. The improvement was led by wholesalers (from -3.2 to 4.9), retailers (from -5.8 to -0.6), and construction (from -11.8 to -7.5). The outlier was services, which fell from 9.1 to 8.5. This is consistent with the latest readings from Markit’s survey of German purchasing managers. Our Second Recovery scenario for next year received a lift from November’s Housing Market Index, which was reported yesterday by the National Association of Home Builders (NAHB). It rose to 46 last month, the highest reading since May 2006. It is highly correlated with single-family housing starts. The NAHB’s index of traffic of prospective home buyers was unchanged at a 6½-year high of 35, up 17 points since April. Existing homes sales rose 2.1% during October after falling 2.9% during September, and remain on a slow uptrend. Helping to boost demand is that single-family home prices are starting to move higher. The median price rose 10.9% y/y during October, the fastest pace since January 2006. Rising home prices should revive long-dormant buy-in-advance attitudes in the housing market. The recovery in home prices is helping to boost consumer confidence. Imagine all the homeowners who have negative homeowners’ equity, which may be turning less negative. Some of them might be able to refinance their mortgages. In early November, the Consumer Sentiment Index jumped 2.3 points to 84.9, the highest since July 2007. This improvement was confirmed by the recent strength in the Bloomberg Consumer Comfort Index. The S&P 500 fell 1.4% last week, ranking in the middle of the 41 stock markets we monitor in a week when just six markets rose. The S&P 500’s performance last week tied or outperformed all the major MSCI indexes. 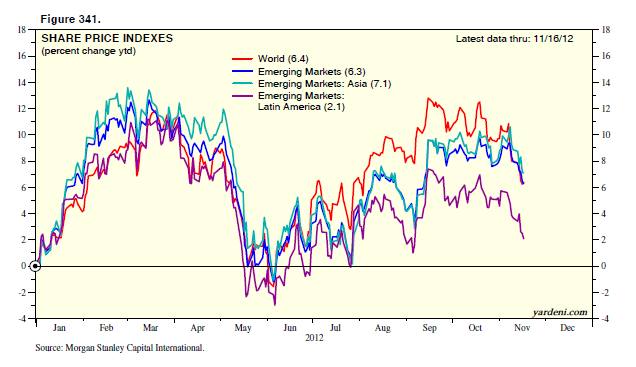 Their performances from best to worst: MSCI EAFE (-1.4%), MSCI World (-1.5), MSCI Emerging Latin America (-1.6), MSCI Emerging Asia (-1.7), and MSCI Europe (-2.6). The S&P 500’s 3.7% decline so far in November ranks 35th of the 41 markets. Year to date, the S&P 500 (8.1) is ahead of all the MSCI indexes including MSCI World (6.4), but its ytd ranking has slipped to 20th from 5th since the beginning of October. The Euro Mess remains as messy as ever. However, investors have been less concerned about a financial meltdown in Europe ever since ECB President Mario Draghi volunteered at the end of July to do whatever it takes to avert a euro cliff. Furthermore, the Europeans continue to kick Greece down the road rather than force it out of the euro zone. Nevertheless, Europe is sinking deeper into a recession. That’s becoming a more significant concern to investors I’ve talked with recently, especially if the US economy falls off the fiscal cliff. Particularly unsettling yesterday were massive and widespread anti-austerity protests across Europe. The strikes and demonstrations, some involving hundreds of thousands of people, hit more than 20 countries in the EU, disrupting airports and ports, closing roads and public transportation, and shutting some essential services. The biggest protests were in Portugal, Spain, Greece, and Italy. The union-led protests--called "European Day of Action and Solidarity"--were mostly peaceful, but turned violent in Lisbon, Madrid, and Rome. September was a bad month for European output. Industrial production in the euro area fell 2.5% m/m, with sharp declines in Germany (-2.1), France (-2,7), Italy (-1.5), and Spain (-5.1). During the month, there were also big drops in Greece (-9.0), Portugal (-12.0), and Ireland (-12.6). Output in the UK has been hovering around its lows of early 2009 for the past few months. The S&P 500 is down 6.2% from the year’s high of 1465 on September 14. It is up 9.3% ytd. It could certainly rebound 6.6% back to the year’s high if the fiscal cliff is averted. I’m not sure that there’s enough time to do much better than that. So breaking out to a new record high may have to wait until next year. Once again 13 is turning out to be an unlucky number for the forward P/E of the S&P 500. The latest and the previous two rallies in the S&P 500 since mid-2010 hit a brick wall when the P/E rebounded back to about 13. Since peaking at 13.1 on September 14, the P/E has dropped to 12.3. Over this same period, the forward P/E of the S&P 400 MidCaps fell from 14.8 to 14.0, and the S&P 600 SmallCaps forward P/E dropped from 15.9 to 14.4. The market hit the year’s high the day after the Fed announced QE3 on September 13. The rally stalled as investors awaited the Tuesday, November 6 election results. The S&P 500 is down 3.8% since last Tuesday's close, after investors apparently concluded that the odds of going over the cliff had just increased. 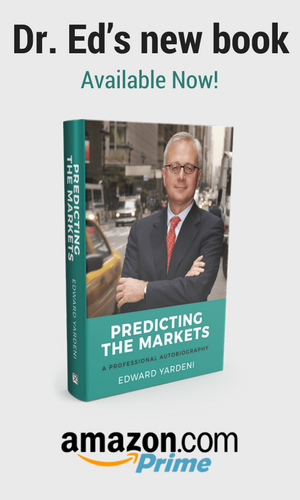 If that doesn’t happen, stocks are cheap and the P/E could easily rebound, maybe even above 13. If it does happen, the previous low for the P/E was 10.2. Before we examine the microeconomics of earnings, let’s have a look at the macro picture. It’s surprisingly upbeat currently. Now that profit margins are back at previous cyclical highs, earnings will be driven by revenues, as long as margins hold steady. S&P 500 revenues per share is highly correlated with manufacturing and trade sales in the US, which jumped 2.8% over the past three months to a record high during September. The y/y growth in business sales is up 4.4%, edging up from a recent low of 2.8% during July. There are lots of potential shortcomings with this macro analysis. US business sales are limited to goods. The data do not include sales of services. A significant portion of S&P 500 revenues comes from abroad. The business sales series does capture merchandise exports, which are also highly correlated with S&P 500 revenues. Exports rose to a new record high during September as well. However, revenues generated by sales of goods and services produced abroad by S&P 500 companies are not reflected in either US business sales or US merchandise exports. With the global economy depressed by a recession in Europe and slower growth in emerging economies, the strength in US macroeconomic data has been offset by weakness abroad. That’s clear from the 90% of S&P 500 companies reporting so far that their Q3 revenues fell 1.5% y/y. A resolution of the US fiscal cliff before the end of the year should set the stage for a rebound in revenues and earnings growth to 6%-8% next year. If we go over the cliff, all bets are off. The good news is there is some good news coming out of China. Since 2010, the Three Horsemen of the Apocalypse have been a double-dip recession in the US, a financial meltdown in Europe, and a hard landing in China. If the fiscal cliff is averted in the US, the prospects for the US economy are reasonably good in 2013. But first, it must be averted. The Euro Mess is as messy as ever. However, bond yields have remained relatively low in Spain and Italy thanks to ECB President Mario Draghi’s promise to provide unlimited liquidity to both countries as soon as they ask for bailout funds from the European Stability Mechanism, and accept its conditions. So far, neither country has even asked for help from the ESM. 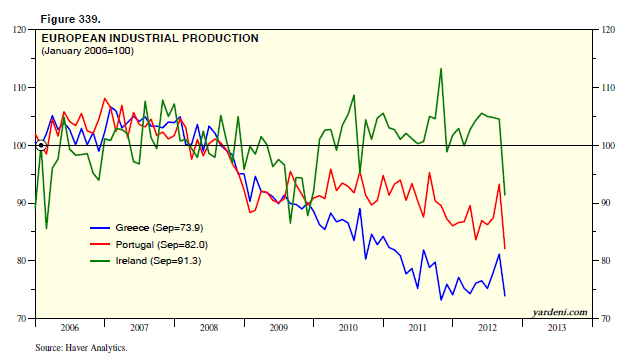 (1) Industrial production rose 1.4% m/m and 9.6% y/y to a new record high. Retail sales rose 14.5% y/y. Auto sales rose 6.4% to 1.3 million vehicles, rebounding from September’s 0.3% contraction. Investment spending rose 25.2% y/y. (2) Exports rebounded 2.1% m/m during October, very close to the record high earlier this year during May. This is an encouraging development since it confirms our view that the global economy may be slowing, though still growing. Also on the upbeat side was the 6.1% m/m increase in imports. The rebound in Chinese exports during October was led by a 2.1% increase in exports to the rest of the world, i.e., the total excluding the US, EU, and Japan. These exports now account for a record 61% of China’s exports, up from 50% six years ago. China’s recent dispute with Japan may account for some of the weakness in trade between the two over the past couple of months. However, China’s exports to Japan are down to only 7.2% of the country’s total from about 16% 11 years ago. The first four years of Obama were very bullish for the stock market. The S&P 500 rose 66% from January 2009 through October 2012, using monthly averages of daily closing data. That compares very favorably to the 50% average of the first terms of the past 11 presidents starting with FDR. The S&P 500 rose 16% during the second terms of the past six presidents who were reelected. Yesterday’s 2.4% drop in the S&P 500 instantly discredited the widely held view that the initial response to an Obama victory would be bullish because the Fed would remain free to pursue QE3 for at least another four years. Fed Chairman Ben Bernanke is now likely to be reappointed in early 2014 for another four-year term if he wants to keep his job. If not, he’ll be replaced by a like-minded successor. Today’s WSJ lists the usual suspects who would make good Bernanke clones, including Janet Yellen, Don Kohn, Roger Ferguson, Alan Blinder, and Larry Summers. So why the Bronx cheer from investors? President Barack Obama faces lots of issues around the world that pose significant risks to the US economy. The fiscal cliff may actually be the easiest one to deal with if a deal can be struck between the Democrats and Republicans. (1) US and China. The latest batch of US economic indicators for October confirms that the US economy continues to grow at a leisurely pace despite fears that growth could stall. We reviewed Friday’s better-than-expected employment data on Monday. Yesterday, we reviewed the PMIs, which are all above 50. Moving above 50 for the first time since July was China’s M-PMI during October, but just barely to 50.2. China’s NM-PMI was stronger last month, rising to 55.5 from 53.7 the previous month. Elsewhere in the Asia-Pacific region, Indonesia’s real GDP growth held above 6% for an eighth quarter as domestic consumption and rising investment countered an export slump. (2) Europe. On the other hand, German factory orders fell by 3.3% during September. Foreign orders tumbled by 4.5%, led by a plunge of 9.6% in orders from the euro zone. Domestic bookings dropped by 1.8%. The area's recession is starting to spread into the strongest economy in the euro zone. That’s confirmed by the latest M-PMIs, with the one for Germany falling 1.4 points to 46.0 (a two-month low). France’s index (43.7) remained around September’s 41-month low of 42.7, and Italy’s M-PMI dropped to a 40-month low of 45.5. Will the storm surge offset the fiscal cliff? Let’s think outside the box for a minute, very far outside the box. Let’s assume that there is no deal on either postponing or fixing the fiscal cliff problem. Everyone knows that this will cause a recession at the beginning of next year. Government spending will be cut, and taxes will go up. That’s certainly going to push the economy over the edge. (1) Payroll employment. The growth in payroll employment on a year-over-year basis has been exceptionally steady, hovering around 1.5% for about a year. On the other hand, private-sector wages are up just 1.6% y/y, with the wages of nonsupervisory production workers up just 1.1%, the lowest on record. Then again, productivity rose 1.5% y/y during Q3, with unit labor costs up just 1.1%. That’s good for profits, and profitable companies tend to expand by hiring more workers. (2) Purchasing managers indexes (PMIs). October’s M-PMI edged up from 51.5 during September to 51.7. The NM-PMI edged down to a still respectable 54.2 during October from 55.1 the month before. These moves were led by an encouraging jump in the M-PMI’s new orders index from 52.3 to 54.2 in October, while the NM-PMI’s new orders index declined from 57.7 to a still solid 54.8. (3) Employment PMIs. Friday’s employment report was certainly full of good news, as I discussed yesterday. So was yesterday’s NM-PMI employment index, which rose from 51.1 in September to 54.9 in October. On the other hand, the M-PMI employment index fell from 54.7 to 52.1. The average of the M-PMI and NM-PMI employment indexes edged up from 52.9 in September to 53.5 in October. 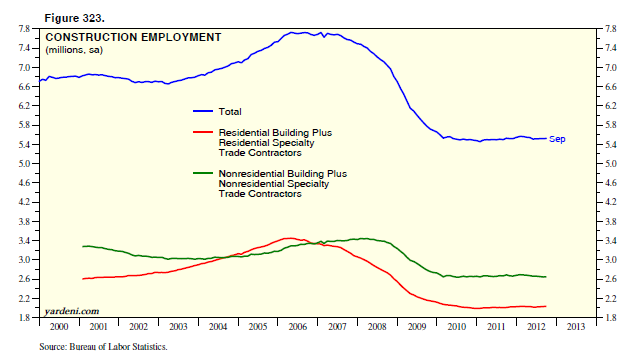 Friday’s employment report augurs well for my “Second Recovery” economic outlook for 2013. Of course, I am assuming that the fiscal cliff will be averted. Let’s slice and dice the latest numbers. During October, payroll employment rose 171,000. The previous two months were revised up by 84,000, resulting in a three-month average gain of 170,300. I give more weight to the revised data for the prior two months than to the latest month's preliminary estimate. That’s because upward (downward) revisions tend to confirm that the labor market is improving (worsening). So the latest data are encouraging, as is the positive 12-month trend in the revisions. There’s plenty more good news in the BLS report. The household measure of employment comparable to the payroll measure rose 733,000 during October, following a gain of 294,000 during September. Over the past two months, the overall household measure, which is more volatile than the payroll one, rose a whopping 1.28 million. After driving around my neighborhood on Long Island yesterday to survey the damage done by Hurricane Sandy, I’m changing my forecast. I think we will be without electricity for much longer than a week. Power lines are down everywhere. Many are supporting broken trees that are dangling dangerously over the roads. The repair crews can’t even begin to do their jobs until all the tree debris is removed. I was hoping to see an army of workers repairing the damage. Instead, they were nowhere to be seen. Burying all those utility lines would certainly be a good stimulus program for the economy. The American Recovery and Reinvestment Act (ARRA), passed by Congress in February 2009, supposedly allocated a significant portion of the $800 billion in stimulus money on “shovel-ready” construction projects. I don’t believe these included burying wires and cables. So where did all the money go? If all that money had gone into construction, then the industry would have greatly expanded its payroll tally, which has been flat-lining around 5.5 million workers since 2010, more than 2.0 million less than the record highs of 2006 and 2007. 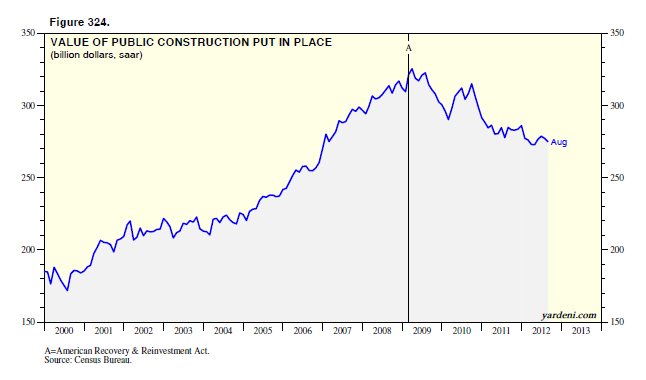 Digging down into the data on public construction, the only uptrend since 2009 is in spending on health care facilities. There are downtrends in spending on education, sewage & waste disposal, power, and water supply structures, with transportation facilities turning up recently.